Enjoy the beautiful scenery whenever you like with the quaint outdoor gazebo at Town hall Terrace. 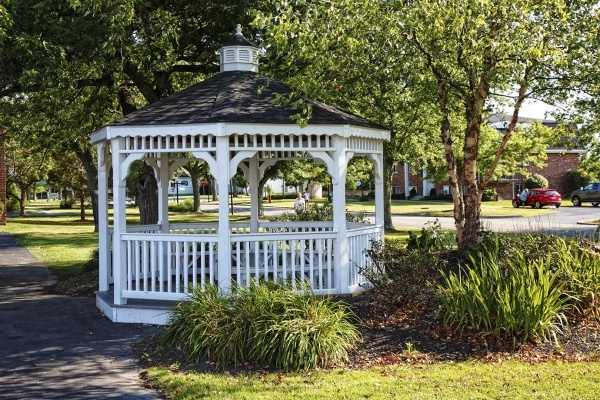 If you are looking for a quiet escape amongst the relaxing surroundings, the gazebo is the perfect place to settle in. Bring your kids, join your roommates or bring a guest and enjoy the day amongst the shady trees and gorgeous gardens. Town Hall Terraces features a wide array of apartments, townhouses and patio homes in Grand Island, NY, all with complete access to the many features and amenities throughout the area. The gazebo is one of Town Hall Terrace’s exceptional hidden gems, giving you a full view of the landscape as well as privacy and seclusion. Bring a game, a book, a picnic or just bring a friend and enjoy the afternoon in the peaceful surroundings. Visit today to see all of Town Hall Terrace’s common areas, outdoor features and indoor amenities. Schedule an appoint to tour your preferred home as well and see everything that Town Hall Terrace has to offer.